I’m a big fan of yogurt, especially the thicker kind like Greek yogurt. If I had to go without it during TEOTWAWKI you might as well end my world right then and there. But really, I love yogurt and if you’re like me then you probably would like to have it around after the SHTF. If that’s the case, it’s definitely a good idea to learn how to make it NOW…especially from your long-term food stores. Speaking of long-term food storage, hopefully you guys are working on building your long-term food stores (if not, check out Prepper Academy to get exact step-by-step details into how to build up a solid food-storage plan as well as master the other aspects of prepping). As part of your long-term stores, I HIGHLY recommend having powdered milk. Besides obviously reconstituting it to have milk, there are quite a variety of things you can make from it like different cheeses, “sour creams”, and yes, even yogurt. 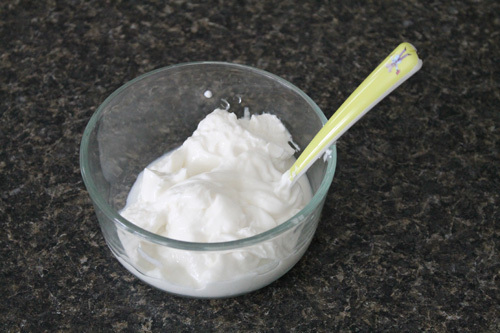 The key with making yogurt from your food storage is to have a starting yogurt culture available. This can be easily acquired by purchasing yogurt from the store. Once you make your own yogurt from the instructions below, you can continue to make yogurt by saving a little off from the previous batch, continuing this process for as long as you’d like to have yogurt. “Yogurt Incubator” – This can be many things. Basically you want something that will maintain a steady temp of around 100°F – 115°F for 3-4 hours. In my example I use an Excalibur dehydrator but you can also use a crockpot, a slow cooker or even a large pot filled with water on a very low heat (this must be monitored). Your yogurt mixture can be placed in a jar which is then placed in the warm environment (like with the example shown here or immersing the jar in water that is kept at a warm temp) or you can place the mixture directly in the cooker (like in a crockpot or slow cooker). Step 1: Reconstitute powdered milk. In a pot, add 2 cups of water to 1 cup of powdered milk and stir until mixed thoroughly (this is stronger than how you would normally reconstitute the milk). Step 2: Heat milk. 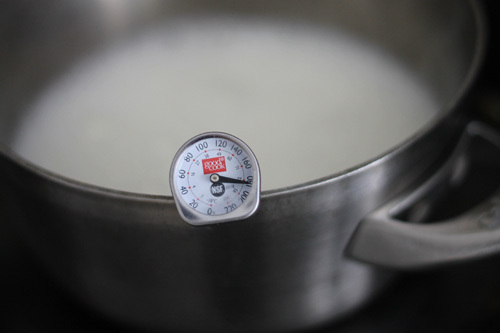 Using a thermometer for accuracy, heat milk to 180°F. Step 3: Remove milk from heat. 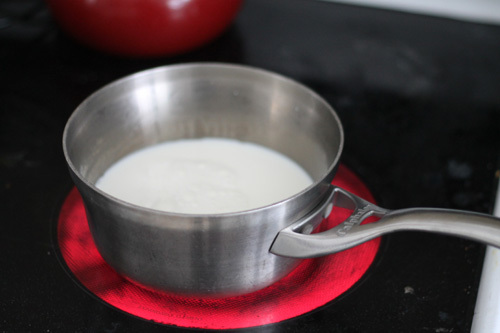 After reaching 180°F remove the milk from the heat source and let it stand until it reaches a temp of 110°F. During a SHTF type of situation I could use my hot-water canner and place the jar in there (NOT AT BOILING TEMPS THOUGH). You would need to babysit it quite a bit to ensure that the temps don’t get higher than 115°F. Step 6: Remove yogurt from incubator. After around 3 to 4 hours, check on your yogurt to ensure it has coagulated (just look, don’t stir or disturb!). At this point there may be a small amount of whey separation on top (hard to see in this picture). If so just pour that little bit off and enjoy your yogurt while warm or refrigerate for normal cold yogurt. (optional) Step 7: Make Greek-style yogurt. 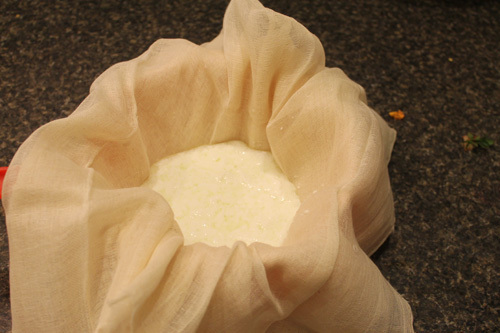 To make a thicker yogurt like Greek-style yogurt, just pour your yogurt in a cheesecloth, coffee filter, or even a cotton t-shirt and hang it over the sink for a couple hours (until the thickness reaches your liking). Step 8: Flavor (if desired) and enjoy!. If you’ve made Greek yogurt, keep in mind you’ll lose about half the volume of the original batch (my two-cup recipe in this example made around 1 cup of Greek yogurt). Your starting yogurt culture was dead before you used it. 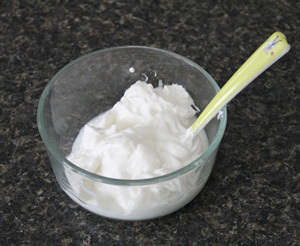 Be sure to purchase or use fresh yogurt with active cultures. You killed the yogurt culture. You possibly added the yogurt to too hot milk (didn’t wait until it reached 110°F before adding) or you killed it in your incubator. In either case, ensure the temp of the culture never reaches much over 115°F. You disturbed the yogurt while it was “incubating”. Do not mix, stir or otherwise heavily disturb the developing yogurt. It’s ok to visually check it or move it VERY SLIGHTLY to ensure it has set. Yogurt was in the incubator too long. If the yogurt has separated quite a bit and is bubbly, you likely kept it in the incubator too long. Are you using instant or non-instant powdered milk? (The granular stuff from the store or the talc-like powder from the cannery). I’m using the stuff from the cannery (non-instant). I like to add a tablespoon of gelatin to my home made yogurt. It gives it a nice firm consistency. I’ve made flavored yogurt by adding a package of jello. Gelatin. Hmm, I’ve never thought of that. Thanks for the tip Buffy! If we have a dire situation like SHTF I am doubting very much that most people will have the presence of mind to search out yogurt with LAC, but I may be mistaken. However, I am planning for my back-ups to have back-ups. I am really needing to know how to begin with having no LAC? What do you do when you don’t have a starter yogurt to work from? Any advice would be helpful. 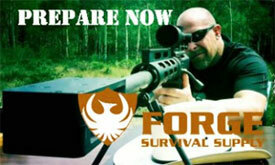 After SHTF, people will be desperately wanting as many things returning to normal as possible. Having food that you and your loved ones are accustomed to eating is a big morale booster and comfort. As for a LAC, yeah, I’ve been looking for that answer as well. My plan (at the present) is to never run out. Since we make yogurt quite regularly here I’m hoping I’ll always have a LAC available. I used to buy yogurt starter powder from a natural food store-they stopped carrying it but I’ll bet it’s still out there somewhere-I think it was European. Hmmm. Our family really loves yogurt. We go through 10 – 15 of those little tubs a week. I am torn on this one. I really like the idea of making yogurt from powdered milk. I am just wondering how to keep the LAC alive in a long term stored condition. From what I am finding, the shelf life of homemade yogurt is about 21 days in the fridge. I guess this could be possible if you don’t plan to run out of homemade yogurt. If you have to bug out for a remote location, taking yogurt with you would not be one of my first priorities. In any event, this is a great article. 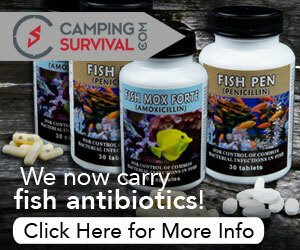 We may not be able to use it for a long term plan, but it will serve us well before a SHTF event. Thanks. Thanks. I thought so, but wanted to make sure. They both work a little differently. I’m wondering if a bread proofing box would keep the culture warm enough or even a hot box made with cardboard and straw? I will have to play around with this a little. If the culture doesn’t set up, you can still use it in cooking so no waste. Hey guys – there’s packets of yogurt starter cultures on Amazon – looks like they’ll last about a year unopened. I have a yogurt maker which holds 6 individual pots and keeps it at a low, even temperature. It doesn’t have a timer so I have to keep an eye on it, but I believe that newer versions do and also have an auto cutoff. Years ago, I used to leave it overnight on the drying rack above my wood stove, once it was closed down for the night; it was usually done by breakfast. Yeah. That’s probably not a good option in that the packaging says that it shouldn’t be used as a starter (look in one of the comments). I was wondering how cultures would survive in powder form anyways. LOL I kind of figured that there was going to be a problem with trying to start LAC on my own. Nothing ventured, nothing lost. I use a Playmate cooler to incubate my yogurt. Fill it w/ very hot water and let it sit while I heat the milk. Then when I am ready to put the jars in the cooler I dump the hot water out of it and put warm (@120 ) water in just to the rims of the jars. I use 1/2 pint canning jars. Works great. I purchased a bottle of probiotics (live culture) at the health food store that I’ve been using for the past year. One bottle with 90 capsules for $20. For one quart of the prepared milk, I open one capsule and within the 4 hours my yogurt has set. I found this cheaper than yogurt culture starter and always have an open bottle in the frig in case I don’t keep a starter from my previous batch. the answer may be to stock up on freeze dried yogurt starter..then when SHTF won’t have to worrry about keepng refrigerated yogurt starter. Thanks for that. 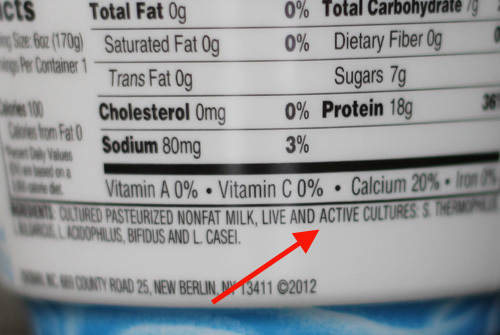 I never realized they made freeze-dried yogurt culture. I found some on Amazon but am having a hard time determining the shelf life. FYI, I am pretty sure most yogurt cultures die above 120F so you may want to revise the 150F thing it will only lead to a lot of rotten milk. You probably want to log-in and make that one critical correction ASAP! Please check out kefir grains — if you drain the whey from the product you will get something very much like Greek yogurt, and kefir coagulates at room temperature. I don’t let mine do the “secondary fermentation” as it is too tart for me. And you get more grains with time, so you can split them off to other people. They also contain a lot more probiotics than yogurt cultures do. 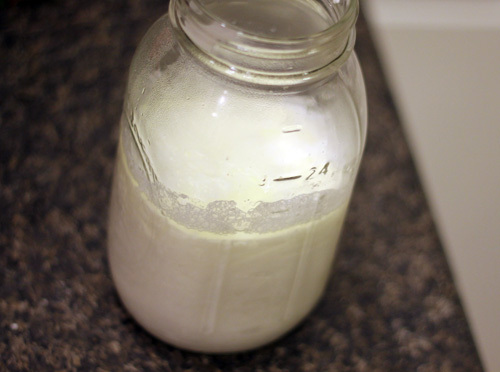 It takes me about 6-14 hours to kefir a quart of milk depending on temperature of the room, and quantity of grains. The best part is it all happens at room temperature. A couple of thoughts. As far as dry starter keeping well, it reminds me of tales of the Gold Rush era when miners would dry out their sourdough starter so they could travel with it – some of those starters lasted many, many years. They would simply reconstitute it when they needed it. I can’t imagine a yogurt starter would be that different but I don’t know for sure. The other thing is that if you pour out your whey consider saving it for other uses – it has tremendous protein value – think of the dried whey protein powder they sell in the stores. Liked the comment about using the playmate. We use any small cooler or insulated box with quart jars filled with hot water. Of course it takes practice but, works well. Also like the idea of the kefir grains and room temp coagulation. Starting with any system and getting experience is a great starter for migrating to other possibly simpler or more basic technology for doing a given skill. when a economic collapse or a revolutionary or civil war ensues, the best place and education you can have is a wilderness survival retreat and education. the wilderness can give you a place for cover, and provide for all your needs. It served our revolutionary ancestors well and it can serve us well also. 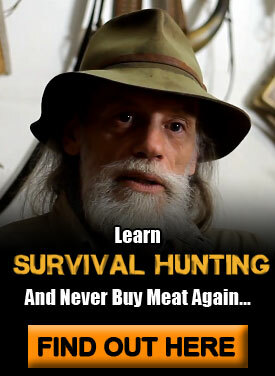 This is a link to sigma 3 survival schools. A butane cooker was recommended to me for indoor use. Is this type of gas safe inside a SHTF kitchen? Be sure to crack a window for ventilation. I use heating pad on low. Put my three jars on it, wrap with a towel, then put a bucket on top. 7 hrs later, yogurt. Great idea Janie. I love it. Making yogurt is a lot easier than people think. I had bad luck the first couple times I tried it because I didn’t sit it in a warm spot and the first time I put all of the milk powder in at once and it never mixed right. Now I sit it on my heater vent and that works great. Now that it’s getting warmer it will probably go in a sunny window. So, i found this site as i am attempting to make yogurt myself. I was wondering why they 180 heat then back down to 110. 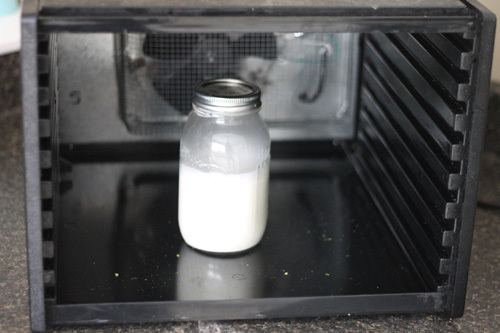 Powdered milk is ultra pasterized, why not just use mix and heat to 110 put your started in and place it to incubate. 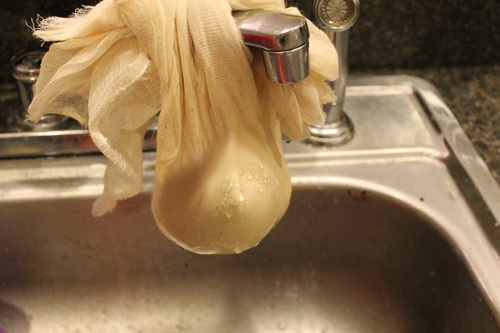 I was reading on another site that with powdered milk if the water it got enough to handle (straight from the tap) it would be sufficient and then place in the warm bath for 8 hours or so depending on strength.. has anyone tried this method. Great comments. You’re probably right about not needing to bring it up to 180. I guess I’m just hyper-careful. Does the amount of starter will affect the whole thing? I mean, if i dont put exactly the ratio of the starter to the milk? Thank you! I don’t think so (if it’s within reason). I’ve done it with 1 tablespoon instead of the normal 2 for the recipe above and it still made good yogurt. Hi Guys, havn’t been here before but some good info to read, thanks. On the Question of where to get your starter, I had the same question and experimented with the powdered yogurt mix from the shop which you would put into a yogurt maker with cold water. After making a batch of yogurt and eating it I kept a couple of tablespoons of the made yogurt aside for another batch and mixed it with longlife milk (could probably use powdered milk for this as well) voila, another batch of yogurt. My next experiment is to seperate the original powdered yogurt mix into say 5 portions and vac seal for long term storage and then make up a small portion or yogurt just as a starter, then use that to make the bigger batch. I was dubious at first but obviously the culture survived the long term packaging. The pack i used was at the end of a two year life. I read down and saw the post about the probiotics, that was interesting too. Awesome comment jonny! Thanks for the personal experience. I’ll be looking into the powder. Has anyone tried making yogurt in a solar box oven? The type you make from 2 cardboard boxs, the smaller one is lined with foil, then insulate between the boxes, lay the oven on its side and prop a piece of plexiglass in front. It needs to be turned to follow the sun. It may be a good option if no electricity. I have made hot process soap in one (requires low heat), but it did hot get hot enough for bread. It depends on the sun. When I made yogurt years ago I used a 25 watt lightbulb in a cardboard box, sealed or closed real good after putting small cups of the yogurt inside and let go for 8 hrs or so I believe or overnight or whatever worked checking on its consistency. That way the yogurt was ready for each child already in cups. My grandfather used to make yogurt by using pint jars, putting them in a pan of warm water, covering with towels and placing on the top of the refrigerator overnight. It always worked great. The little bit of heat that comes off the top of the fridge was perfect. For me the simplest way to keep your yogurt warm is just put it in a thermos flask and leave for 7/8 hours. Perfect yogurt every time if you prepare it correctly! I make 5-6 pints at once. Mixing 2 quarts of hot water (under 110 degrees) with 2 3/4 c powdered milk. then I stir in 1/2 c of LAC yogurt… I buy a quart and freeze it in muffin tins . When frozen I put in freezer bags so I am ready for the next batch. Sometimes I add an envelop of knox gelatin if I want it thicker. Pour into desired jars with lids. ( i use old pint size jam jars) I use a cooler to incubate them. I put the jars in and if there’s room I add extra jars full of hot water. If not, I just add hot water to just below the lid. 6 hrs works for me. If you like a sour yogurt let it incubate longer. They don’t appear very thick at 6 hrs but refrigerating them makes them thick. Now.. just a couple of comments. I have used powdered starter and it works well too. In fact, I keep a couple packages in my freezer for the SHTF days where I can’t get culture. As a previous post mentioned dry milk has no live bacteria so there is no need to heat it and cool it back down. Different bacteria create different tasting yogurt so experiment with what you like best. Kefir culture is not the same bacteria as yogurt but it too is delicious. It incubates at room temperature but will also grow in the refrigerator … just much slower. I hope this has been helpful for your readers. Thanks for the posts. Greeting, I have a lot I need to buy buttermilk powder (Dough Powder}. The powder suit and customers is delicious and satisfy customer .If you yogurt powder prepared our properties we have listed above are welcome. Please 500-1000Grmy of sample packages with prices and delivery time for us to send a sample taste test. What is the actual milk/water ratio in yogurt production? I found some research says 1:4, 1:3 and 1:2 depending on the thickness. Also, one can use cornstarch or gelatin as a thickner. I am using life culture with self-life of 1-year. My supplier said I can use it to make 250L if I am using it as both culture and preservative or 500L as just a starter culture. How much powdered milk will I then use to make this quantity? Your saliva has LAB as well as other things like amylase enzyme that will change starch into maltose sugar. Thanks so much for this wonderful information. God bless! …just picked the nearest bookmarked page from an enormous site loaded with experience.